December 1, 2016 By Elizabeth Lindemann Leave a Comment / This post may contain affiliate links. 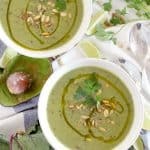 This Broccoli Avocado Soup with Beet Greens is one of my favorite ways to detox after over indulging. And I’d say the Thanksgiving feast last week… plus four days of leftovers… certainly counts as indulgence. This week has been PACKED with veggies, and this soup was the best part! It’s creamy, vegan, Paleo/Whole30 compliant, and ridiculously healthy. Let’s talk about beet greens for a minute. Before you get any further, I want to make sure you know that you can use spinach, kale, chard, or other leafy greens instead of beet greens. But if you’ve never used beet greens before, I recommend it! I got a bunch of beets to roast for an AWESOME salad (which I’ll post about soon) and didn’t want to waste the edible and super healthy tops. Beet greens are packed with vitamins K, A, C, E, and B, with lots of iron and protein as well. You can eat them raw in a salad or cook them as you would any other green. They do tend to be a little grainy, since they come attached to the beets that have been pulled up out of the ground. To clean them, place them in a colander in a bowl of cold water (or in a salad spinner insert filled with water). Then, lift the colander or insert to drain them, and rinse as you normally would. This technique also works very well for other gritty foods, like leeks. Like all leafy greens, the nutrients in beet greens are best absorbed by the body when paired with healthy fats. Luckily, this soup is made with olive oil and avocado, both of which contain very healthy fats. Olive oil is most healthy when it hasn’t been heated at all, and a drizzle of good quality, unfiltered EVOO on top of the soup is both tasty and a great way to up your healthy fat intake. I used a super nifty tool to help me trim the beet greens from their tough stems. This leaf-shaped greens and herb stripper is one of the niftiest things I have in my kitchen! It makes a great stocking stuffer for the cook in your life. It’s perfect for all kinds of greens with tough stems, like chard and kale, and more delicate herbs like thyme and rosemary as well. Just stick the stem in whichever hole is the best size and pull! It’s magic. I also highly recommend using an immersion blender to make this. You can use a standing blender as well, but an immersion blender will make your life SO much easier because you can blend it right in the pot. One last thing: this recipe only takes about 25 minutes total to make and freezes beautifully. I have half of this batch in my freezer right now because I know I’ll be craving more veggies when the holidays are over! Love green veggies? Try this recipe for Green Machine Minestrone Soup or this Green Goddess Pasta Salad– two of my favorites. 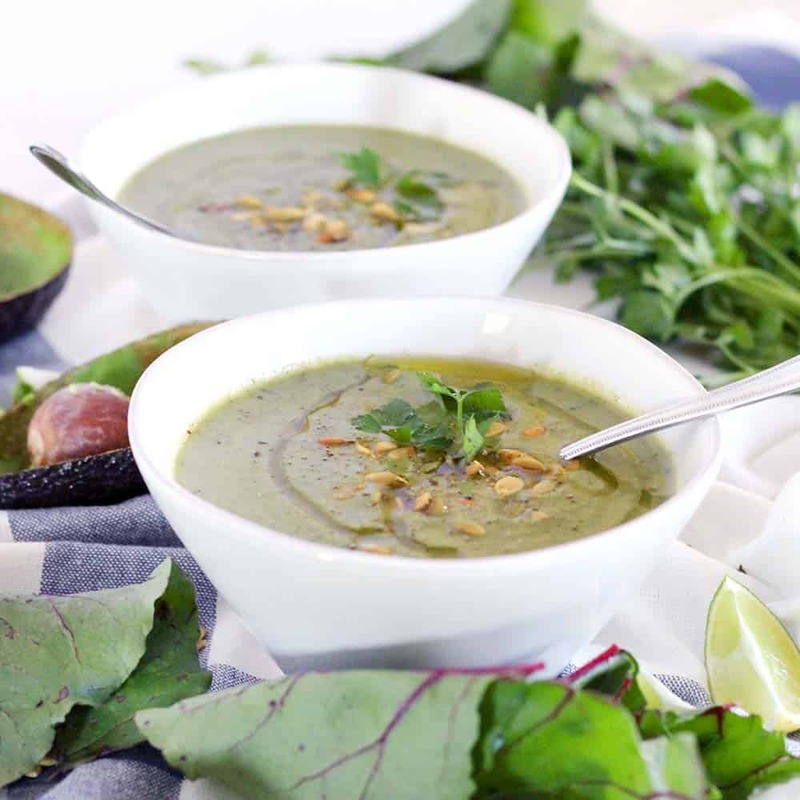 Recipe for Broccoli Avocado Soup with Beet Greens below! 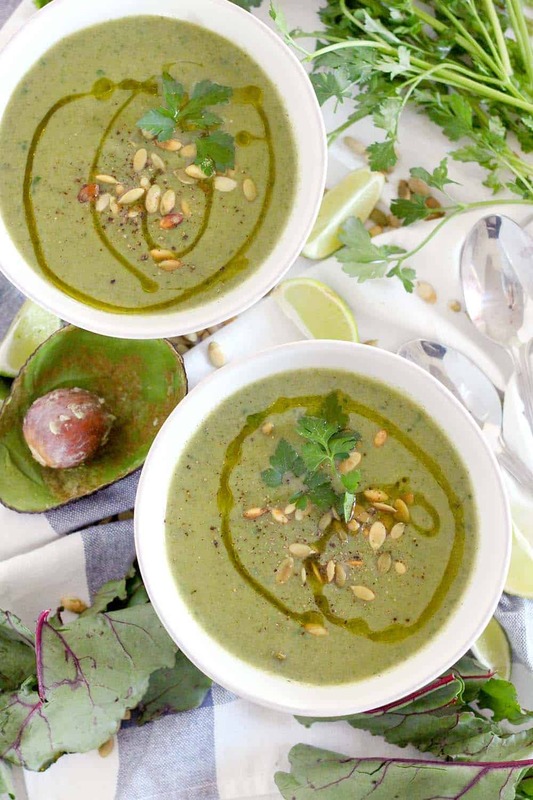 This Broccoli Avocado Soup with Beet Greens is creamy, vegan, and SUPER healthy. I love this soup as a detox after over indulging! You can use spinach, kale, or other greens as well. Saute the onion in a large pot in the olive oil until softened (about 3 minutes). Add the avocado and lime juice and use an immersion blender to blend the soup to a puree. Alternatively, you can use a standing blender in batches. Serve the soup hot topped with toasted pepitas, a drizzle of olive oil, pepper, and extra parsley, if desired. Like a super thick soup? Use only 4 cups of stock and add more if you need to until you reach the desired texture.